Beaches, Eats, Shops, Trees, Flowers, Frogs, Birds: Go Native! 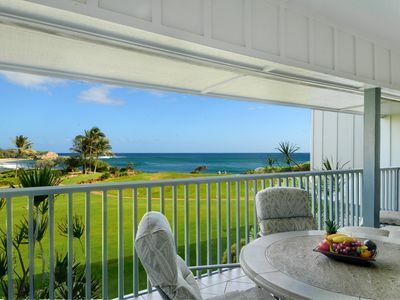 Waikomo Stream Villas is a lovely SMALL RESORT property in the heart of POIPU'S BEST SHOPPING, DINING, AND BEACHES. 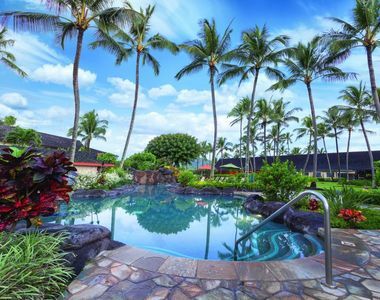 A mature TROPICAL GARDEN with many flowering plants is the centerpiece of this 3.9 acre resort of several surrounding three-story wood buildings, a POOL and children's WADING POOL, and attractive GARDEN WALK. 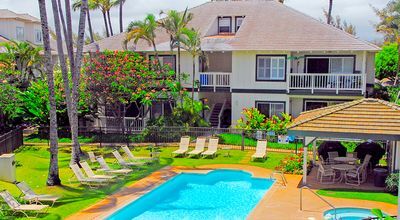 Waikomo Stream Villas 102 is located on the ground floor in the center of Building 1, adjacent to parking and close to the pool. 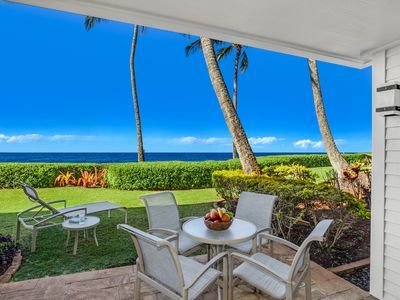 This SPACIOUS (1,050 sq ft) one bedroom condo opens onto a PRIVATE, COVERED GARDEN LANAI from both the living room and the bedroom. 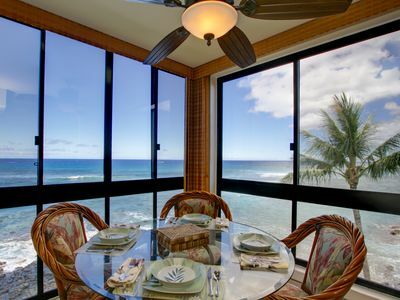 The bedroom is NICE-SIZED (208 sq ft) AND PRIVATE, with its own door into the bathroom and a sliding glass door to the garden lanai. 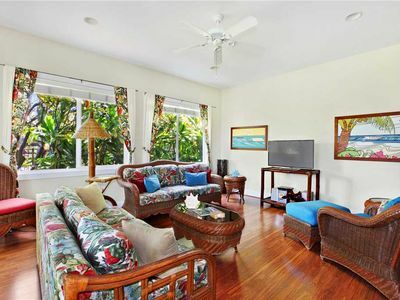 The rest of the condo has an OPEN FLOOR PLAN partially divided by the kitchen into TWO FAMILY ROOM-STYLE AREAS: the living room opening onto the GARDEN LANAI, and the dining area opening onto a SECOND LANAI near the front door. 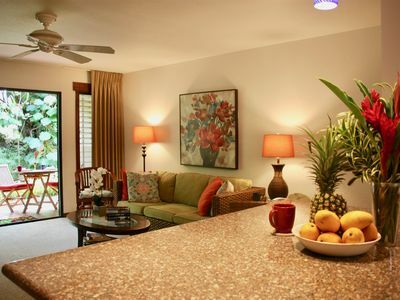 The KITCHEN has an open floor plan with two islands, including a breakfast bar, and new, high end lighting. The BATHROOM has a walk-in tile and glass block shower. 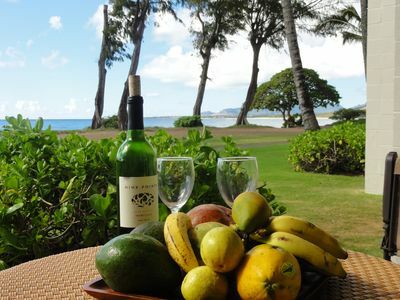 Waikomo Stream Villas is one of the few resorts in Poipu in which having a car is not an absolute necessity. 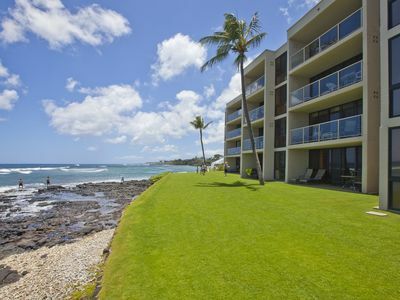 The best BEACHES, SHOPPING, including groceries, and multiple DINING options are all within EASY WALKING DISTANCE. A bicycle rental shop is a 3 minute walk away. A taxi to/from the airport is about $50 each way. 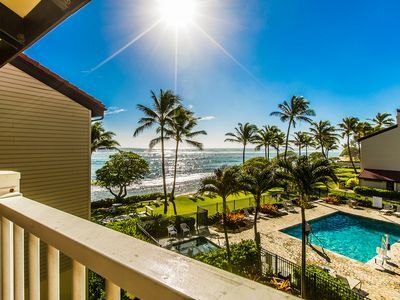 Most visitors rent cars, and if you do, Waikomo Stream Villas is CENTRALLY LOCATED, and all of the Poipu beaches, shopping, dining, and sightseeing are within A FEW MINUTES DRIVE, with easy parking at the door of the condo and EASY PARKING EVERYWHERE in Poipu. 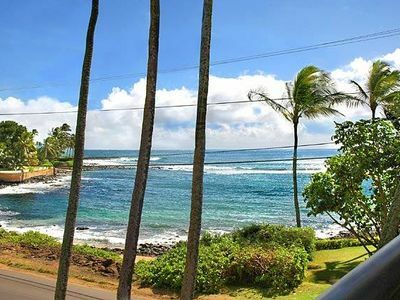 Lihue is about 14 miles away, and the north shore about 50 miles away. 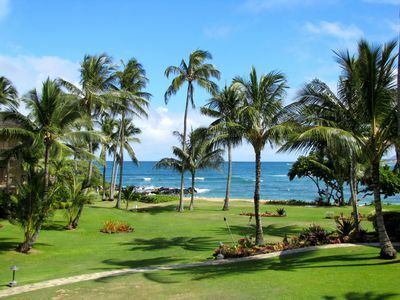 The lush tropical garden includes mature TREES and shrubs, and many FLOWERS, BIRDS, AND FROGS. The garden's wildlife can get noisy at times. A good rain especially brings the garden to life. 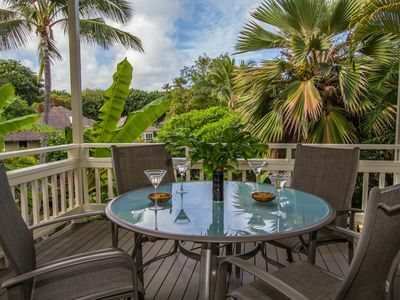 Most visitors get used to the garden sounds and consider them a CHARMING part of their TROPICAL ISLAND EXPERIENCE. The bedroom has thick, 3-ply sound-proofing curtains and they help a bit in creating a quiet sleeping environment when frogs are active. A good quality ceiling fan creates a breeze in the bedroom even with the windows shut and the curtains pulled. The daybed can make a comfortable single or double, quiet retreat for light sleepers who need a break from the garden noises nearer the bedroom. 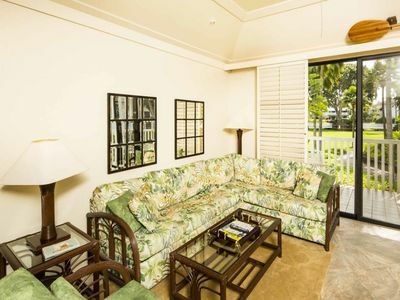 The 3.9 acre Waikomo Stream Villas property was acquired in 1980 from the estate of the HAWAIIAN PRINCESS, Bernice Pauahi Bishop (December 19, 1831–October 16, 1884), who was the great-great-granddaughter of KING KAMEHAMEHA I, and his last surviving heir. 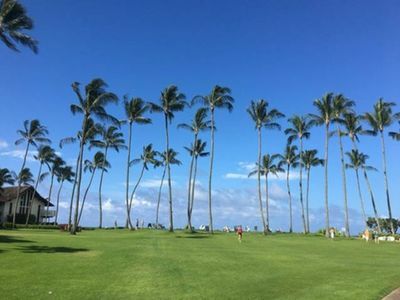 We think the ROYAL history of the property adds to its charm. The swimming and wading pools were renovated in 2013. An area adjacent to the pool, the former tennis court, is being landscaped right now and will become an extension of the pool area during 2014. 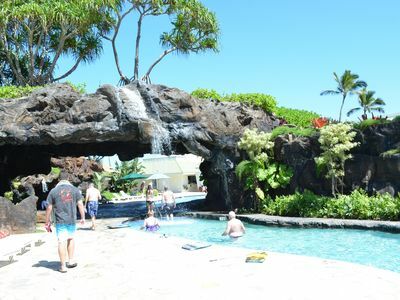 Kapaa Shore Resort #324, Ocean View, Washer/Dryer, Great Location and Views! 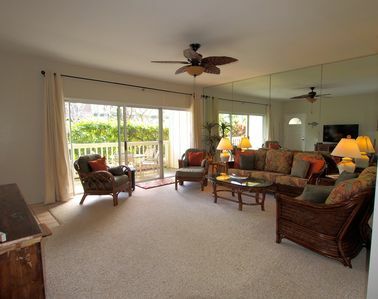 Everything you could ask for in a condo! Great Location!! Walk to the Beach!! 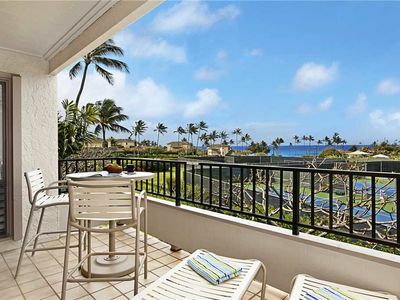 Poipu Sands #523 - OCEAN FRONT VIEWS with HEATED pool & AC! 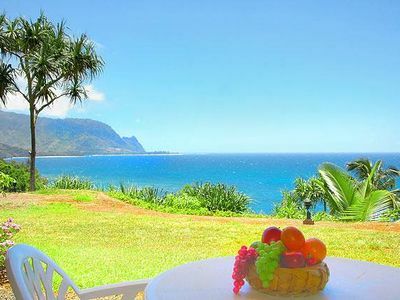 Beachfront luxury resort, Top Floor Ocean View, King size bed. 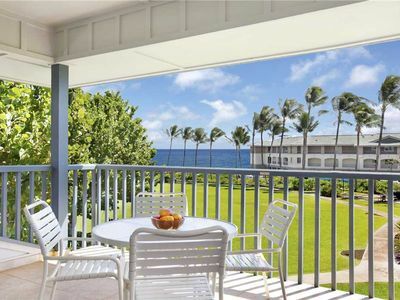 Kuhio Shores Oceanfront Condo Amazing Ocean Views & A/C in the Bedrooms! 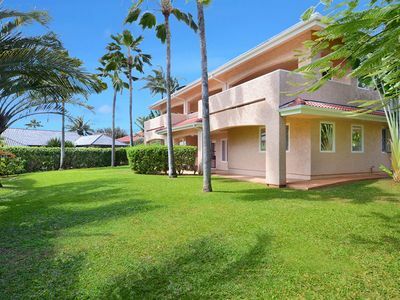 Spacious 8 br for 19 Poipu kai villa!